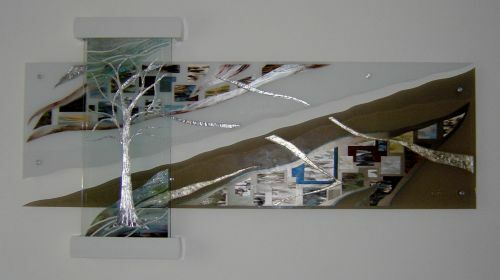 Three glass installation, paintings on clear, opaque white and transparent bronze glass creating a continuous image. Sand blasted design adds extra interest. Fitted with 6 metal fittings, the installation has 25 mm gap with the wall. The front clear glass has a 3D tree design in silver leaf and is fitted proud from the other two glass panels, secured with gloss white "pelmets" on top and bottom.